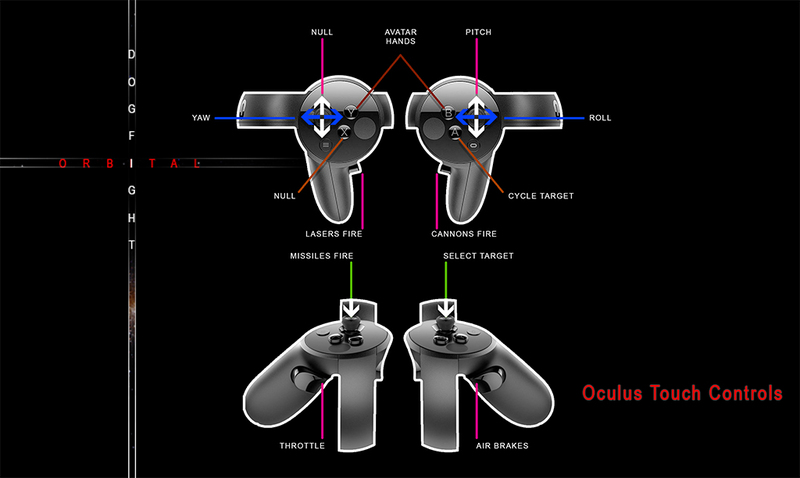 Orbital Dogfight is a new VR Orbital Combat Sim for the Oculus Rift. Take command of your ship in a world with real orbital mechanics. DON'T PANIC you've got head-tracked weapons, built-in voice commands and a host of flight assists to aid you. Control space and you control it all! Fun for a few minutes and fun for a few hours! What ever suits your schedule. Real Orbital Mechanics: Master your ability to out maneuver your enemies in space. You cant kill what you cant see.... orbiting above you at some thousand meters per second dropping all kinds of death! Big Scale: 100 km Equatorial Radius Tech Planet to explore. Asteroid rings and more. Epic Weapon Systems: Where you look so too do your weapon platforms. Assisted by radar and easy target acquisition there is no excuse for living hostiles. Lasers, cannons and missiles are your basic tools of destruction. 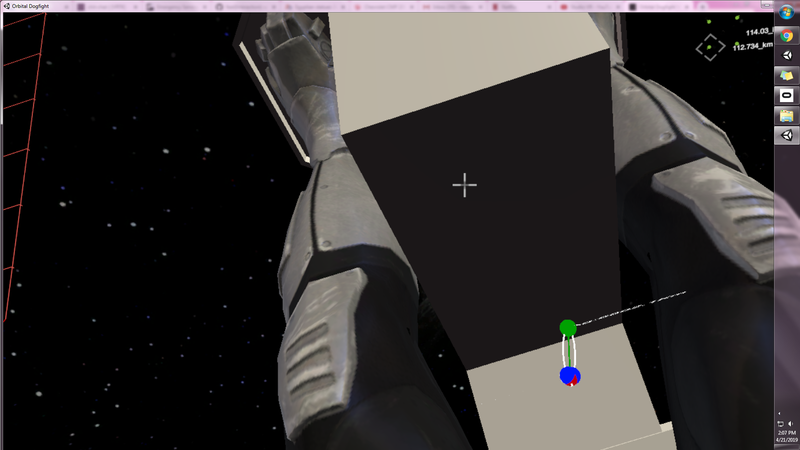 Assists & Commands: Piloting your ship with a combination of voice commands and avatar hands. There is no maneuver you can't pull off or target you can't exploit. Free for now. Players who give feedback and contribute will be given free Keys for all later stages, just play it and give helpful advice and you're in. When the game is under its own power the price with reflect the work that has gone in. Who is making Orbital Dogfight? 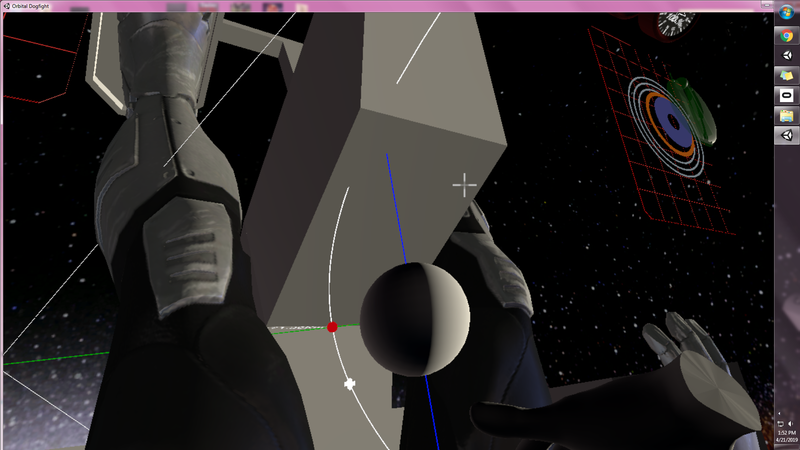 Right now it is just me, Moga Creative, standing on the shoulders of giants. This is a super basic prototype. Enjoy and play responsibly. 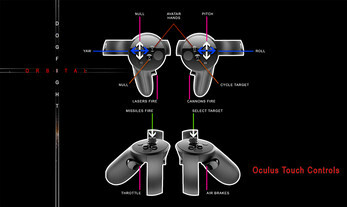 Tested on the Oculus Rift CV1. Recommending solid VR rig for this. Runs at about 100fps on a Gtx980ti. it's not very pretty of an orbit but I think those are orbital lines yea? Congratulations @StudioVR!!! =) The first image technically shows an escape trajectory . The second image however looks like a viable orbit (maybe very eccentric) but I am giving it to you! Well done!!! Going in the records books as 'first to space,' 'first to Orbit' and first to 'escape trajectory!' Thank you @StudioVR! Dopppeeeeeeeee! Put me down as Devastatin_Dave in the record books. Really nice flight mechanics you've got going on here too my only gripe is I'd like a lil more cockpit for a better frame of reference but I don't want to lose the ability to "look down" so it's a tough call on how to address that but I'm sure you will figure it out. Cool, I was just talking about possible games like this and just saw you follow. Does momentum build up so that acceleration in one direction needs to be cancelled out before moving backwards? Do you have twitter? Maybe we can have a chat about this? Thanks for taking a look Michael! Yes , velocity is conserved as well as angular momentum. To head in the opposite direction the ship would need to cancel is forward velocity. There is not a Twitter handle for OD yet but it is now on the list. Love to chat more about the mechanics. Thanks again! So glad to hear you added that touch of realism! Nice work!